As mentioned at the tail end of my most recent post, over the last several years, I’ve become increasingly interested in where the food I buy comes from. There are multiple and varying reasons for this, although the most influential one for me is the health factor, followed closely by supporting the local economy and small business farmers, who have struggled in recent decades. Although I think it’s positive to buy locally sourced food because it travels a shorter distance, that opinion is related to the quality of the produce and the long term viability of sourcing food that way, and not to other potential implications. Living in Macon, Georgia, I typically go to the downtown farmers’ market, called the Mulberry Street Market, held every Wednesday afternoon / evening. I enjoy living in a state with such respect for its agricultural heritage, although its farmers face the same struggle as other states – competition with massive distributors that drive down prices and increase competition for store awareness and shelf space. Maine also has a strong agricultural heritage and awareness of local farms is on the rise. Below, I’ve highlighted a few farmers’ markets and other considerations for buying food locally. The Maine Federation of Farmers’ Markets website is a great resource for shoppers and farmers alike. From this site, I learned that Maine has more than 130 farmers’ markets and 25 of these are year-round (click here to see the winter’s farmers’ markets). If you live in the greater Portland area, check out the Portland Farmers’ Market at one of its alternating locations. The great thing about this market, given the cold winter climate, is that it is year round. In mid-November, they move to an indoor location. From April – November, they are in Deering Oaks Park on Saturdays (7am – 1pm) and Monument Square on Wednesdays (7am – 1pm). Just outside Portland, you can visit the Greater Gorham Farmers’ Market, held on Saturdays from 8:30am – 12:30pm between May and October. The market is located on Route 114 between Baxter Memorial Library (where I spent a lot of time as a young adult) and the Gorham Times. If you’re based in Bangor, the Bangor Farmers’ Market has a lot to offer, running on Sundays from 11am – 2pm during the summer months. The Cumberland and Falmouth Markets sound pretty intriguing. In addition to your anticipated farmers’ market booths of fruits, veggies, and meats, they also offer arts and crafts. The Cumberland Market is on Saturdays from 9am – 12pm at the Town Hall on Tuttle Road, while the Falmouth Market is Wednesdays from noon -4pm at Legion Field on Depot Road. Going further north, you can find the Houlton Community Market (open Memorial Day – October on Saturdays from 9am – 1pm) and the Presque Isle Farmers’ Market, also running May – October on Saturdays from 9am – 1pm. There are many, many markets I didn’t mention here. Please do check out the Maine Federation of Farmers’ Markets site for more information if you live in another area. Lastly, just the other day, I began following Casco Bay Organics on Twitter (@CascoBayOrganic). Finding this organization seemed serendipitous as this post was already slowly forming in my mind, and in its way, it is even better (easier) than a farmers’ market. You sign up for a small, medium, or large box, which will be delivered to you on Thursdays filled with local, organic produce. Sounds like a great service! Their website offers much more specific information and insight about the farms they source from. Categories: Eat, Shop | Tags: Bangor, Casco Bay Organics, farmers market, Gorham, healthy eating, Houlton, Maine, Portland, Presque Isle | Permalink. Today is a good day. The New England Patriots won, and by a comfortable margin. Like any good fan, my superstitions are now taking over. As I contemplate the Sundays (and Mondays and Thursdays) to come, I’m giving serious consideration to wearing the exact same outfit, sitting in the same spot on the couch, drinking the same beer, and cooking the same meal. Now, while I might like to mix up the outfit and viewing atmosphere, making the same meal wouldn’t be much of a hardship. 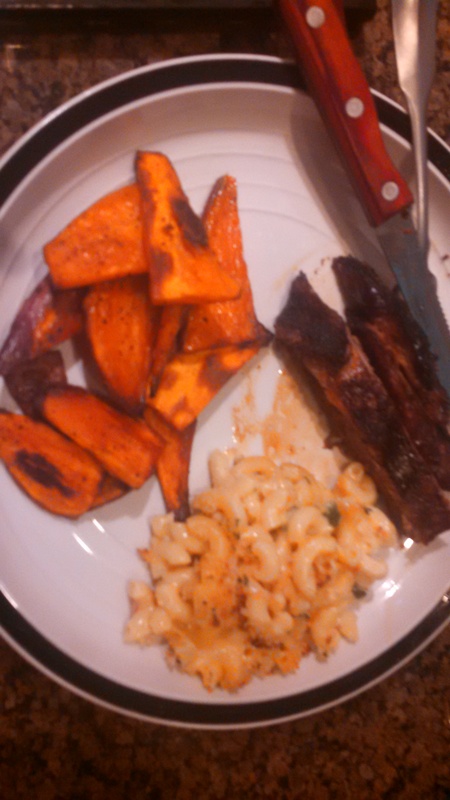 After all, who can complain about roasted brisket, jalapeno mac and cheese, and sweet potato wedges? 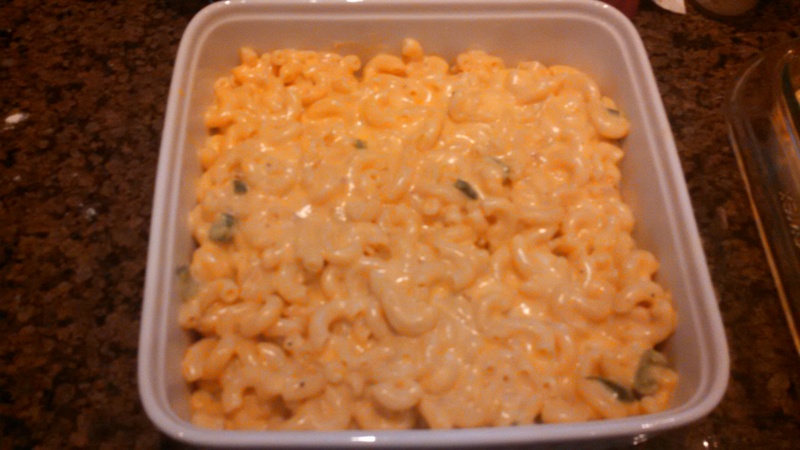 Although this isn’t a weekly recipe entry, I’ll point you to the recipes I used – both the husband and I agreed this entire meal was delicious (and except for the macaroni and cheese, it’s pretty good for you, too). To begin at the beginning, Nick and I had been planning for most of the week to buy and smoke a brisket for our Sunday dinner. It’s something we do from time to time, and more often during football season. 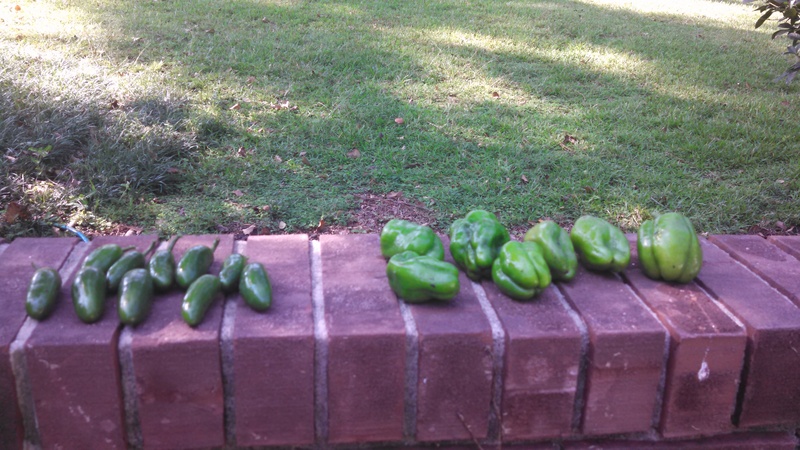 The side dishes remained a bit up in the air, but I picked up a few sweet potatoes at the Mulberry Street Farmers Market in Macon on Wednesday, and yesterday, I harvested a bunch of jalapenos and green peppers from our home garden. While I don’t enjoy certain elements of home vegetable garden care (the pests, the constant weeding, etc. ), I do love having one and the end result is worth the time and effort. Given how strongly I remember resisting any type of work in our family garden as a child, I do find this somewhat ironic, but there it is. It may have taken years to emerge, but those rural Maine roots have come through. 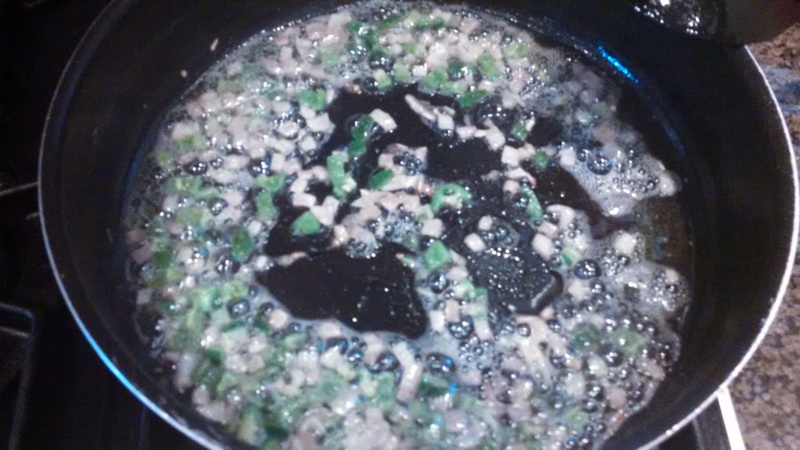 I didn’t have scallions, but I did have a shallot. I’m sure either would be good. Also, instead of Monterey Jack and white cheddar, I stumbled across a smoked bacon white cheddar, and a sharp yellow cheddar, and used about 2 1/2 cups of sharp cheddar and 1 1/2 cups of the smoked bacon cheddar. I skipped the corn. This was really yummy, and the recipe made enough for me to freeze half for a future meal – and tonight’s half had leftovers. This afternoon, we changed our brisket plan from using our smoker (outside) to an oven roast, inside, due to rain. I did some internet searching and selected this Texas Oven-Roasted Beef Brisket recipe, but instead of making the rub with the ingredients they list, I used a rub we already had – happily, the Stonewall Kitchen Texas Rub. Really good! The brisket was tender and flavorful. Having a home garden has taught me to think more about where my food comes from for many reasons. Key among them is simply that the peppers and tomatoes I’ve grown taste better than anything from the grocery store. The ‘why’ is simple: I’m eating them the day, or close to, I pick them – so they don’t have to travel for days or a week to reach me. They ripen on the vine, increasing flavor and nutrients, and, best of all, I know exactly what they’ve been treated with and exposed to while growing. There’s also satisfaction in eating something you grew yourself. For all of these reasons, I also try to shop at local farmers’ markets as much as possible – it supports the local industry and it really is better for you. I’ll follow this with a post soon on Maine farmers markets and on cookbooks that specialize in meals by the season. 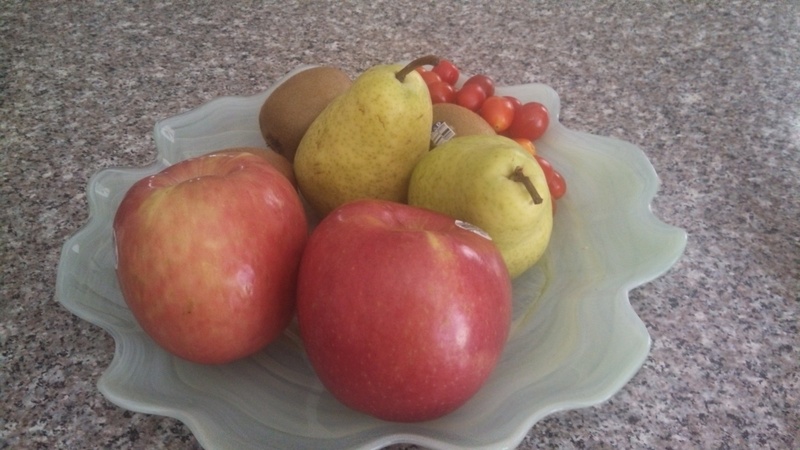 Categories: Drink, Eat | Tags: fall, football, home garden | Permalink. Truly, the title of this recipe says it all. It just sounds exciting… not to mention intriguing. What exactly makes it “party” chicken? And, really, who doesn’t love a good party? I suppose what makes this dish “party” chicken is simply that it’s one of those convenient-for-entertaining meals that slow cooks in the oven and comes out smelling spectacular. It certainly feels like a perfect fall party dish. Its meaty nature will make it a win with any man (Nick certainly enjoyed it), it’s easy with a short ingredient list, and the long, slow cooking makes it an ideal fall Sunday dinner (so as not to distract from watching football). Although it’s still regularly 90+ degrees in Georgia, September calls to mind those first crisp, chilly days in Maine, and the rich, smoky flavor of this hearty meal complements the fall weather nicely (and would be excellent in winter, too). I’ll admit – I was a little skeptical about how these ingredients would come together, but I shouldn’t have been. This meal was really delicious, if not particularly healthy. The recipe comes from a cookbook titled “Keep Cooking – The Maine Way” by Marjorie Standish, which I love because it’s a little bit old school and sometimes calls for ingredients I have to look up (or may vaguely recall from visits at my grandparents’ home). It is a beautiful testament to the tradition of home cooking in Maine specifically. Divide each chicken breast in half, giving you eight servings. 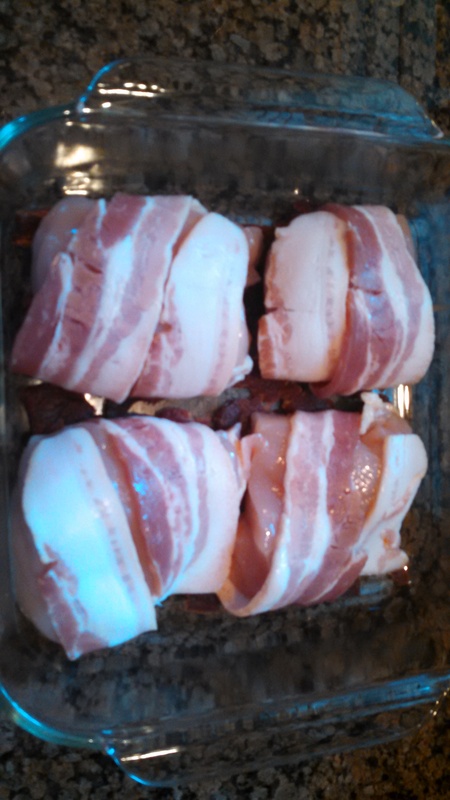 Wrap each half with a piece of bacon. Using a buttered, shallow 9×13 baking pan, cover the bottom with thin slices of dried beef (I used beef jerky, which appeared to be dried beef or similar based on my google search). Arrange the chicken breasts on the dried beef. 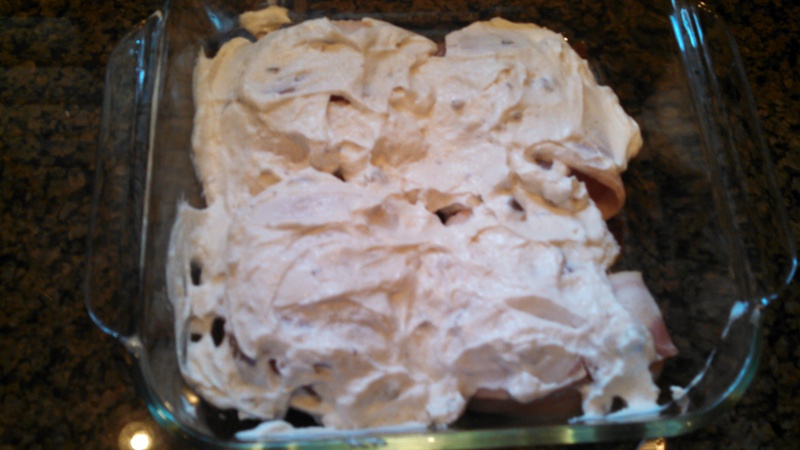 The next day, bring to room temperature before placing in oven (I forgot to do this, and it still turned out well). Bake uncovered at 275 degrees for 3 hours. This recipe made our house smell delicious. Our mouths were watering long before it was time to eat, and we weren’t disappointed when we did. Yum! 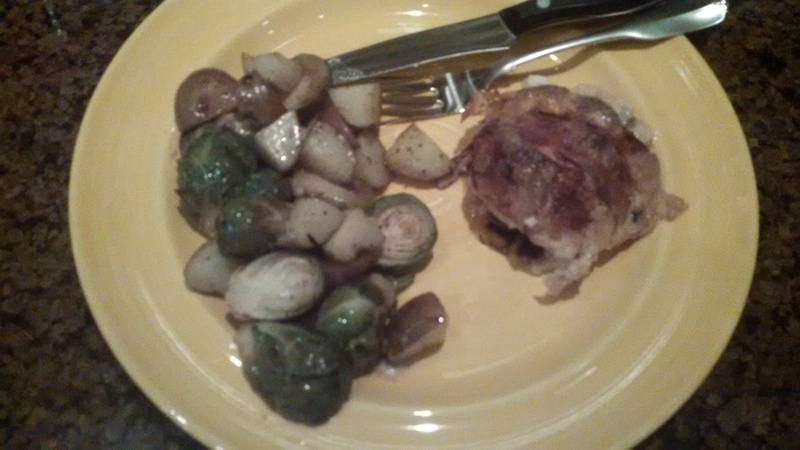 I served this with roasted potatoes and brussel sprouts, and the chicken nearly falls apart from the slow cooking. On a follow up note, we had some leftovers (I love leftovers), and the following night, I made a chicken soup with them. It really ended up being more of a “stoup,” with the sour cream and mushroom soup creating a thicker, creamier broth. I threw in onion, potatoes, kale, and the chicken breast (with beef and bacon), diced up. I added about a cup and a half of water, and the better part of a carton of chicken broth. This was a great mix of flavors as well – hearty and smoky, not much like a typical chicken soup. Categories: Eat, Weekly Recipe | Tags: fall, football, home cooking, Keep Cooking The Maine Way, Maine Party Chicken, Marjorie Standish, recipe | Permalink.